Get great flavor with our Stuffed Plantains recipe. 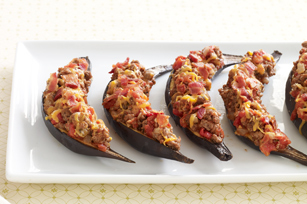 Tasty beef and tomato filling gets topped with bacon and cheese when you make our Stuffed Plantains. Place plantains in 13x9-inch baking dish. Bake 20 min. Cool. Cut plantains lengthwise in half. Starting at one end of each, slide thumb between peel and plantain, then gently lift plantain to loosen from peel. (Do not remove plantains from peels.) Return plantain halves, cut-sides up, to baking dish. Meanwhile, cook onions and garlic in dressing in large saucepan on medium-high heat 3 min. Add meat and oregano; cook 10 min. or until meat is done, stirring frequently. Add tomatoes and 3/4 cup cheese; simmer on medium-low heat 5 min. or until mixture is heated through and cheese is melted, stirring occasionally. Spoon over plantains. Top with bacon and remaining cheese. Bake 5 min. or until cheese is melted. Bananas and plantains are not interchangeable. While they are close relatives, plantains are usually cooked before they are eaten. Yellow plantains are often spotted with brownish-black flecks which are a sign that the sugars in the fruit have begun to develop. At this stage, the plantain is more tender, but still firm, with a creamy texture and slightly sweeter, more pronounced, banana flavor. Prepare with lean ground beef and KRAFT 2% Milk Shredded Cheddar Cheese.